Join The Revolution, Join Ógra Shinn Féin! Are you a young Socialist Republican aged 16 - 29? Do you want to see Ireland re-unified, and radical revolutionary change to her governance? Do you want to to help in achieving the Ireland outlined in the 1916 Proclaimation? Many people often think about joining the Republican Movement, well today make a stand do whats right and join the Republican Struggle, in the words of Bobby Sands, "Everyone has their part to play!" To Join Ógra Shinn Fein, contact your local Sinn Féin or Ógra activist, or alternatively log onto www.osfbf.pro.ie. Onwards to the Socialist Republic! The revolution continues. the struggle goes on! Exactly, there is nothing revolutionary about stormant or leinster house. Its called accepting the status quo. What would you do?? :? Serious question Ogra. How can you revolt against a Government when PSF have been part of, and will be part of said Government. If this Revolution is successful will all the PSF MLA's lose their wages?Have they been told? and (my personal favorite for downright strangeness) blaming William of Orange for introducing the potato blight. We had one here last week posting, "WTF is Normalisation? ", yet Cain tells us they're put through a rigourous, workshop-type course, to learn the politics and history of the party. And the nineteen-year history of the party shouldn't really be too difficult (molto difficile in Italian) to learn. There's nothing sensible about tearing down Anti Extradition poster. Mc Garlnds politics aren't 100 miles away from Adams poitics at present, only Adams using millions in real Dollars. Ho ho, they just had to push it, didn't they? 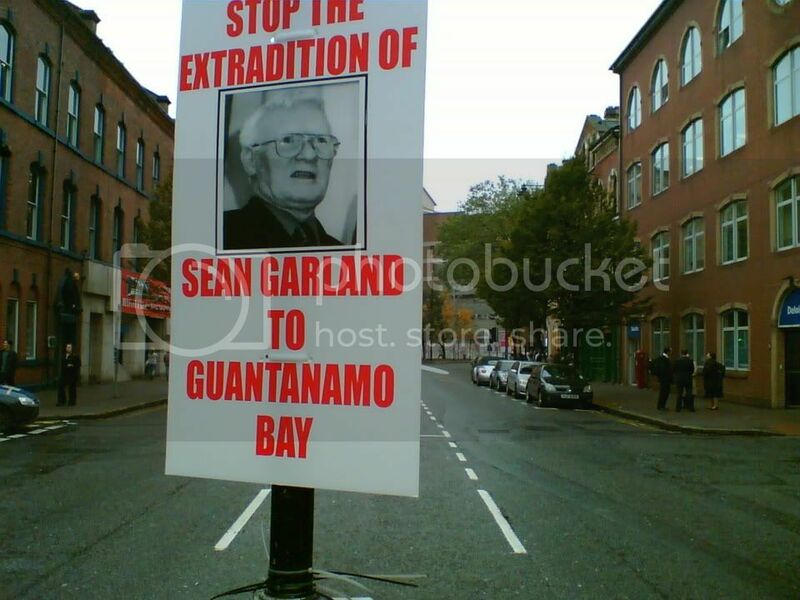 "to Guantanamo Bay" is a lovely bit of hyperbole, but it rather fatally undermines the purpose of the poster. Seeing the poster certainly made me want to do everything in my power to prevent this harmless-looking elderly gentleman being transported to Camp X-Ray, but once I established that there was no prospect of such a thing happening in this particular universe, I decided to go back about my business. Socialist Republican? I thought you shinners weren't allowed to use the S-word any more. Aren't you supposed to describe yourselves as 'leftwing' instead? Quick. Go in and edit your posting before Central Command gets wind. I won't say a word. 'Whatever you say say nothing' and all that. I think that website has been decommissioned! the website www.osfbf.pro.ie has not 'been put beyond use' it is in fine working condition, continuing to revolutionise and recruit young committed Irish youth for the struggle! What kind of a socialist are you Ogra B? Are you a Tianamen Square kind of socialist? Are you a Stalinist death camp kind of socialist? Are you a Nicolae Cauescescu kind of socialist? Are you a North Korea kind of socialist? - The Spanish Civil War, 19361939, 600,000 deaths. - Soviet collectivization and "dekulakization" 16 million to 50 million, though some included in World War II totals in these estimates. - Deaths under Mao, between 16 million and 30 million. He'll probably mention scandanavia, without realising that scandinavia funds their wonderful universal social services with a thriving free market economy and a hard work ethic amoung it's population.